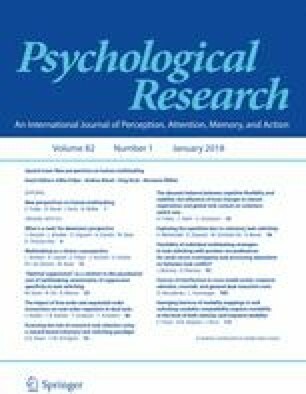 Switching between tasks associated with different requirements of stimulus selection may suffer interference from persisting attentional settings or processes of reconfiguration, possibly constituting a source of task switch costs (i.e., impaired performance in task switch trials compared to task repetition trials). To explore the processes involved in task switching with and without a switch in stimulus selection requirements, we administered a task-switching paradigm that involved task-unique sets of hierarchical (Navon) stimuli, preventing stimulus-related proactive interference (i.e., impaired responding to a stimulus that was previously processed in the context of a different task), and varied, between groups of participants, whether the target stimulus level (i.e., global vs. local) was held constant or varied between the tasks. Mixing target levels impaired performance overall and increased the task switch costs. Moreover, (within-task) global–local congruency effects were larger when target levels were mixed, particularly in task switch trials, suggesting relatively stronger stimulus processing according to the attentional set of the other task. In a second phase of the experimental session, the target level was changed persistently for either one or for both tasks, presumably evoking stimulus-related proactive interference. This change yielded large task switch costs and global–local congruency effects when it resulted in mixed target levels, but not when it resulted in a constant target level. These results are consistent with the notion that stimulus-related proactive interference is reduced by constant withdrawal of attention from the perceptual dimension of the interference-eliciting stimuli. This research was funded by a Grant within the Priority Program SPP 1772 from the German Research Foundation (Deutsche Forschungsgemeinschaft) to Thomas Jacobsen (JA 1009/13-1). The authors thank Ricarda Weil for help with the data collection. Author A declares that he has no conflict of interest. Author B declares that he has no conflict of interest. Author C declares that he has no conflict of interest.